Sportsman 570 Explorer Package. Freight Included. 3.99% for 36 Months. 2019 Polaris Industries Sportsman 570 Explorer Package. Freight Included. 3.99% for 36 Months. 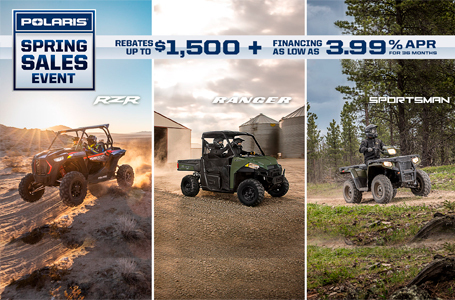 Explorer Package Includes Polaris 2500lb Winch, Front Brushguard, Rear Brushguard, Rear Rack Riser, and Handguards. Price includes installation and Factory to Dealer Freight.